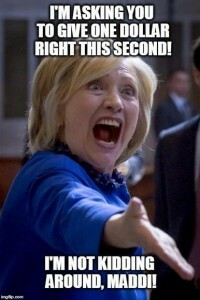 Presidential candidate Hillary Clinton, who is receiving negative press for amassing a campaign fund of $163,672,986 mostly from large donors and super PACs — compared to the Bernie Sanders fund of $75,055,063 — has decided that her solution to this embarrassingly large amount of money is to ask for more money. 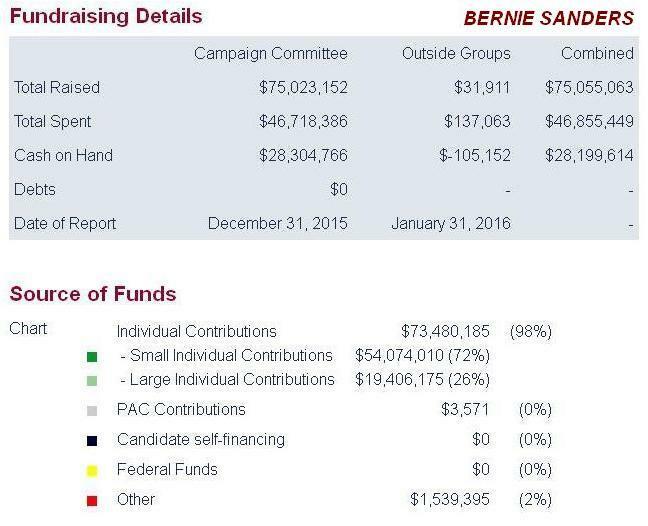 Last year’s fundraising reports show that Sanders raised 72 percent of his campaign money from people who gave $200 or less, while for Clinton those donors accounted for just 16 percent of her funds. Hillary Clinton’s campaign asked supporters to donate $1, and people were not pleased. In an email, Clinton’s campaign told supporters “I’m not kidding” and “to give $1 right this second.” While they weren’t kidding, the internet turned the entire thing into a big joke anyway. Over at Twitter, the hastag #ImNotKiddingMaddi was created to discuss the one dollar issue. A whole series of memes popped up, including this one from ImgFlip.com. There is a method to Hillary’s request for single dollar donations beyond collecting the money. Hillary apparently would like to bring the average down. For example, if Hillary received one million one dollar donations, her average per donor would drop to $93.53. This would change her average donation from 377 percent of Bernie’s average to 161 percent — not nearly so embarrassing. On the other hand, an additional one million dollars to the Hillary campaign would have little effect on her ability to campaign, increasing her total funding only 0.6 percent. Conclusion: this is about appearances, not funding needs.